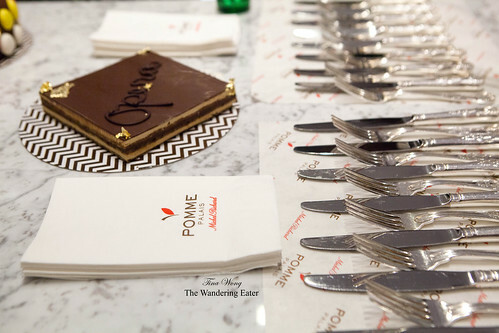 Earlier this afternoon, I was invited to Pomme Palais for a holiday cakes and pastries tasting with the humorous (and a bit of a jokester/womanizer) Chef Michel Richard. All of the cakes and pastries were eye candy when you peer into the many display cases. 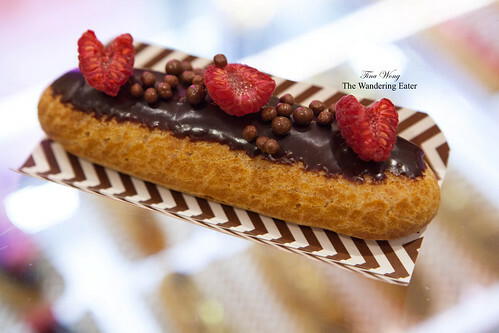 Before we really got acquainted with the cakes, I had the opportunity to try the raspberry chocolate eclair that was balanced and the choux pastry still had some freshness. The most unexpected pastry was the cocoa dusted grapes tart that was refreshing, sweet yet tempered by the bitter cocoa and bounded by the buttery crust. It deceptively looked like cocoa dusted almonds or ovid shaped chocolate truffles. 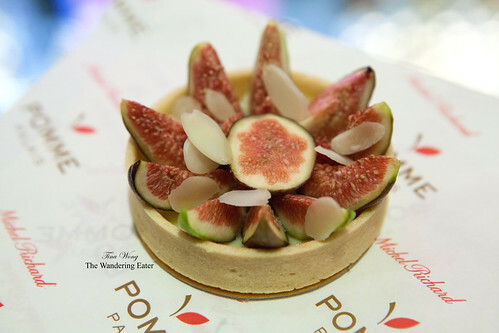 The fig and marzipan tart was pleasantly sweet and simply delicious. The Charlotte ($42) made of fresh fruit, apricot, raspberries, passion yogurt mousse, and lady fingers tasted like the kind of dessert you want after a heavy dinner. 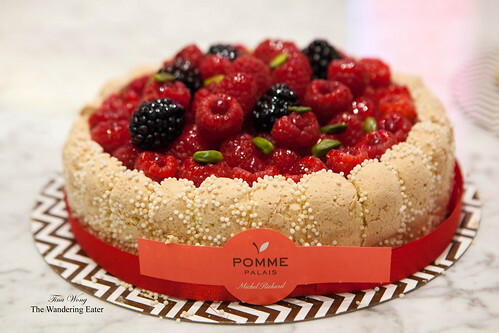 It’s light, silky, and tart from the passion fruit yogurt mousse and the many raspberries in every bite. 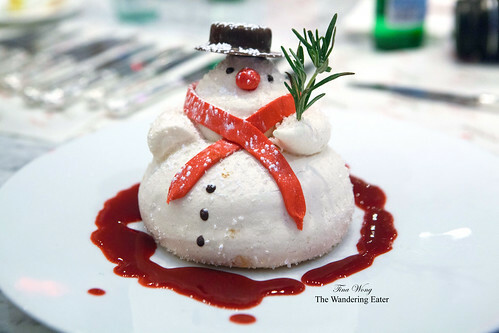 The Michael’s Snowman cake ($20) is a hollow meringue confection that is decorated with a sugar paste scarf, rosemary “tree” and includes with raspberry sauce on the side. 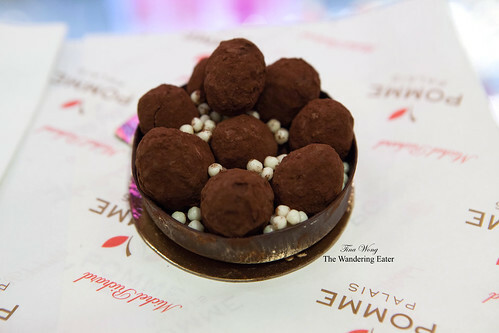 When you purchase it, you should fill it with ice cream but at this tasting, the kitchen filled it with luscious dark chocolate pudding. To tell you honestly, this snowman was too darn cute. My heart kind of broke when one of my neighbors was willing to take a knife and take down that adorable pastry to a tasty mess of crispy meringue and sweet chocolate mousse. 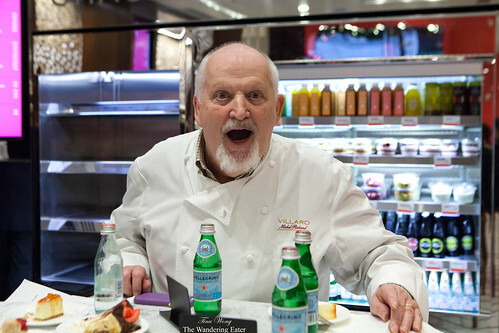 The Tart au Pomme was considered Chef Richard’s favorite and ours too. 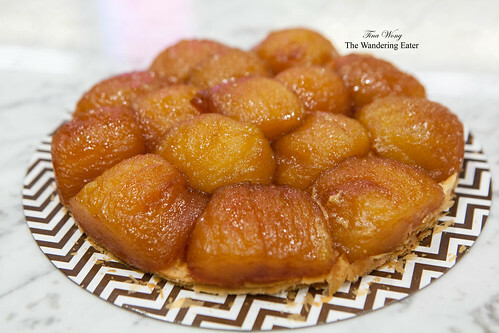 It tasted like the dessert that had the most restraint and really let the apples shine – thin, flaky puff pastry topped with soft caramelized apples. Simple and delicious. 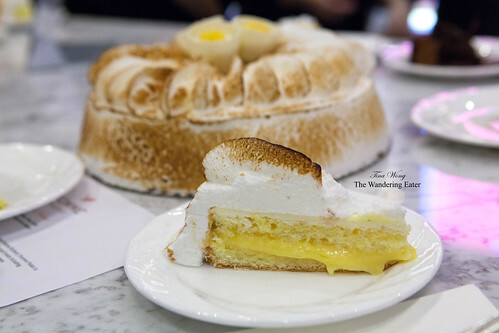 The Lemon Eggceptional Cake ($42) is essentially a lemon meringue cake that’s wonderfully moist and tart. 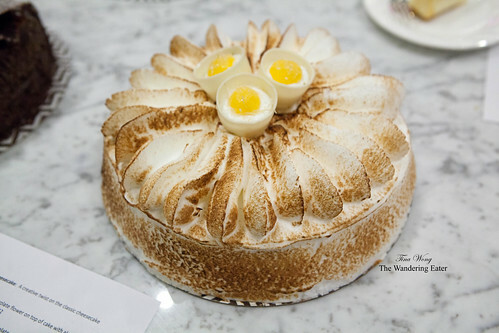 The meringue added a bit of torched marshmallow edge. It’s topped lemon eggceptionals, white chocolate cups that seemed like an egg in there. But like Chef Richard’s playful spirit, it’s fluffy vanilla marshmallow topped with lemon pâte de fruit. If you love lemon, this is your cake. Orange Crème Brûlée Cheesecake ($42) is a cross between a firm flan and slightly creamy cheesecake with a hint of sweet orange. 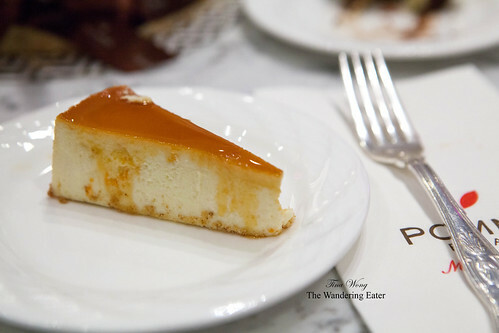 It took me by surprise at the first bite since I was thinking it would be similar to the decadent New York-style cheesecake we’re all too familiar with. It’s a refreshing, if you could ever say that to a cheesecake, version of this dessert. 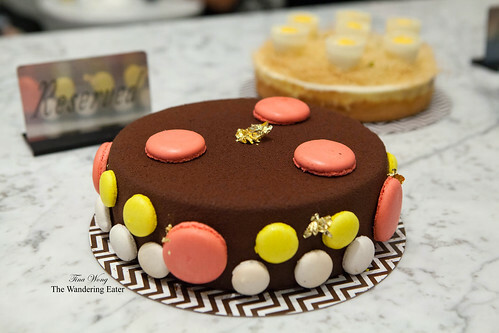 The Macaron Cake ($42) is an almond vanilla cake that’s filled with silky vanilla custard, coated in a dark chocolate glaze and the crisp texture from the colorful macarons. It’s a moderately chocolate-y cake that would fulfill your chocolate craving but not go overboard. 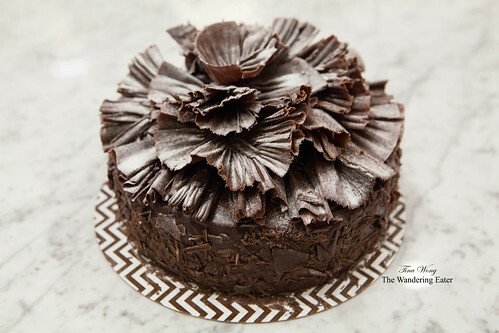 If you want intense, chocoholic cake, the Chocolate Fleur d’Automne ($42) is what you’re looking for. Chocolate cake, chocolate mousse, crunchy chocolate crumbs with feuilletine flakes a slice can go a very long way and possibly can hold you down for a meal as it’s that decadent. 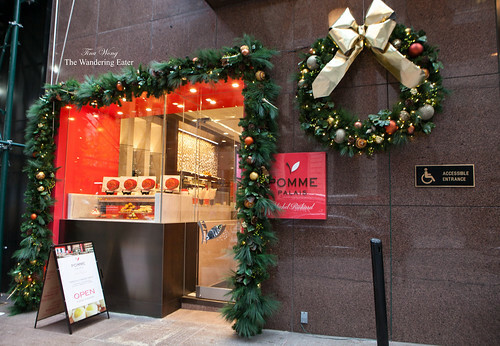 Pomme Palais has a collection of cakes that can satisfy any sweet tooth and great for any occasion beyond the holidays. 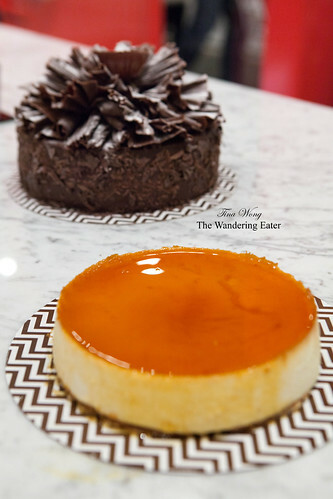 All of the cakes and pastries are modernized and has a twist that appeals to us picky New Yorkers who want something beyond the standard.